Ben 10 Omniverse vs Robot | Play Game Online & Free Download Another addition to our collection of ben 10 running games is the Ben 10 Omniverse vs Robot. This one features Ben’s electric alien – Feedback, who is out there to catch and destroy all the evil robots with his electric energy blast. Help Ben 10 Feedback is passing all the hurdles as he follows robots and destroy them. Another addition to our collection of ben 10 running games is the Ben 10 Omniverse vs Robot. This one features Ben’s electric alien – Feedback, who is out there to catch and destroy all the evil robots with his electric energy blast. Help Ben 10 Feedback is passing all the hurdles as he follows robots and destroy them. But before that, check out the gameplay and other details about the game! Ben has reached the evil Robo lab and transforms into Feeback to destroy all those robots programmed to eliminate the humanity. With the electric fast speed of Feedback, Ben must catch the robots before they escape the lab and make chaos on the street of the city! Make sure Feedback does not fall off the bridges otherwise, there’s no chance you can save humanity. 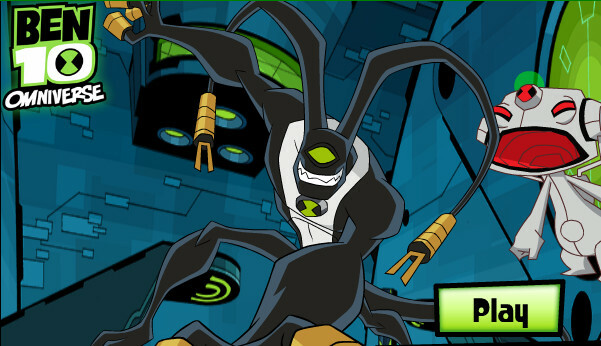 As mentioned in the beginning, Ben 10 Omniverse vs Robot is a running game. Ben as Feedback is running behind the robot and your task is to catch them. It is a single level game where you have to make Feedback run without falling. There are gaps in the path and you have to jump across them else you die! To complete the game, you get 4 lives and one gets deducted each time you fall off the path. Your score depends on the number of orbs you collect while running. For each orb collected, you get one point. As you run further, a number of super orbs appear. Collect them to get the super-high jump power and jump higher to collect more points. Pro Tip: Collect Super-High jump orb to collect hidden points high above the bridges. Make Feedback run fast and jump over bridges to catch robots before they destro humanity! Don’t Forget to give your rating for Ben 10 Omniverse vs Robot game and share your tips and tricks to win this game in the comments section below.